It’s official—I can cross another trip off my 2013 bucket list: I completed a backpacking trip into the Grand Canyon, February 27 through March 2. Not only that, but my group and I successfully hammock camped in the canyon, which turned out to be a little tricky in the end. The question you might be wondering, especially if you are following my blog, is whether or not hammock camping is possible in the canyon. Short answer: Yes, but it’s not ideal. A view of my hammock under the shelter at Indian Garden. My trip into the Grand Canyon began with an invitation from my friend Paul, who runs the hammock camping company Arrowhead Equipment out of Idaho. Paul was eager to fish the famed Bright Angel Creek and along the way do a little hammock evangelism with the park staff. Most folks heading down into the canyon would probably never consider bringing a hammock, simply because of the limited vegetation below the rim. But as crazy and die-hard as we all were, we had to see if it would work. We began with many phone and email conversations with park staff and rangers to check policy and guidance. The park staff were great to work with, helping us identify opportunities and creating a trip plan that would work with our goals. Our success is due to the wonderful staff and rangers who supported this trip and the future work we would do to foster better “hammock relations” in the canyon. Hammocks are allowed in the canyon, but they do have some special considerations. 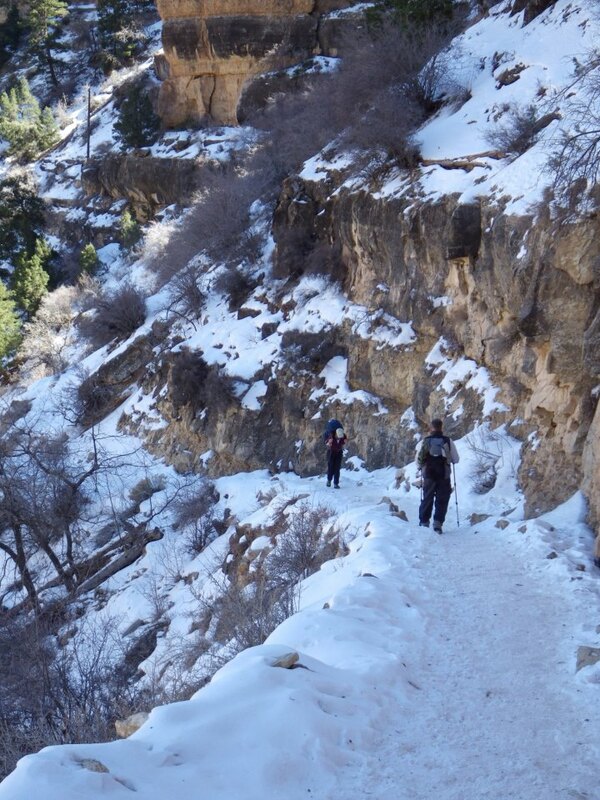 Please check with the backcountry office and the park staff prior to any trip into the canyon to confirm current policies and guidelines. Above the rim, within the park, I was told that hammocks are fine in the campgrounds, but that you must use appropriate webbing to protect the trees and remove the hammocks during the day to avoid entangling wildlife that wonder through the park. Trees are plentiful and accessible in the campgrounds and backcountry sites above the rim. Below the rim, options are extremely limited. First, hanging from the limited vegetation is not permitted, for obvious Leave No Trace reasons. However, hammocks are allowed to hang from man-made structures. There are only two campgrounds inside the canyon that would work: Indian Garden and Bright Angel. Of the two locations, Indian Garden is the most ideal: there is a pavilion at every campsite with posts perfectly spaced for hammocks. At Bright Angel, the only option is the rock shelter in one of the two group campsites. By policy, the group shelter is only available to groups with seven or more on the permit, on a first-come, first-served basis. Because of our trip format, and because of the lower traffic during the off-season, we obtained a special one-time permit to use the group shelter, even though we didn’t meet the threshold. At the other backcountry sites below the rim, the only option for a hammock would be to bring a hammock stand. When I first considered hanging in the Grand Canyon, I planned on bringing the Handy Hammock stand. In this way I wouldn’t be limited in where I could hang. However, upon further research, I realized that trying to secure 12, foot-long (30 cm) stakes into the ground at the campgrounds would be nearly impossible. A friend who returned from the Grand Canyon about a week before our trip warned us that the ground is like “cement.” His description proved to be true, and I was glad I decided to leave the stand at home. Leaving the stand saved about 1 kg (2.2 lbs). I further congratulated myself when I saw our neighbors’ futile attempts at pounding in stakes, only to resort to piling rocks or leaving tents limp. Prepare your hammock with short connection loops as close to the hammock as possible. At Indian Garden campground, I hung on the diagonal in the pavilion. In this way, I didn’t need to hang a tarp. If you hang off the sides, you’ll need a short tarp, or perhaps just hang a tarp off one side as you’ll have some overhang protection from the shelter when needed. For anchor points, there’s nothing better than webbing straps with loops sewn or tied on each end. On the poles, you’ll need to wrap the webbing several times around the metal to limit slipping. Be mindful to keep the connection loop as close to the pole as possible to maximize the limited hang space. I hung my hammock high up in the pavilion, using the table as a stepping stool to get inside. My straps looped around the top posts, allowing me to hang on the diagonal. At the group site at Bright Angel campground, the only option was the stone shelter, but it has challenges. The jagged rock walls can cut into webbing straps, so you might want to invest in a new set just for the trip. I had to be very careful and intentional on where I placed my strap to limit sharp edges. The shelter is also solidly built with very few gaps where straps can be fed. We had a difficult time finding places to make anchor points. In the end, I had to hang my hammock high up in the shelter simply because that was the only way to get the right sag for my hammock based on where my straps could fit around the rocks. A stand would be ideal in Bright Angel, and at the two group sites, there is a pipe stand (intended to hang packs from the wildlife) that is the perfect size for a hammocks. Paul, who brought a very large bridge hammock, was given preference for this location because of his setup requirements. This trip caused me more consternation with my gear selection than any other trip I’ve taken so far. This was due, in part, to the very limited details we had about the hanging opportunities in the campgrounds, so I oscillated between different hammock options. One of my primary considerations was going lightweight. Thanks to the winter season, I didn’t need to worry about bugs, so I could use a simple gathered-end hammock. I brought a 7 oz (198 g) tarp but didn’t end up using it thanks to hanging in the shelters. In retrospect, I could have left that as well. I knew this trip wasn’t going to be the lightest I’ve ever hung before, owing to some extra gear I was packing, including five copies of my book to give away to rangers, some extra insulation (I was worried about the temperature dropping lower due to the canyon effect), and some comfort food. But I was packing considerably less than most of the folks we passed along the trail, which made the extra ounces feel lighter, at least psychologically. For my pack, I used the Gossamer Gear Gorilla, as did one of my hiking partners, Mike Stivers (te-wa under quilts). The Gorilla is turning into one of my favorite lightweight packs, primarily for its load distribution and capacity. Even with all the extra “junk” I brought along, I didn’t use all the liters available to me. Mike surprised us all when he pulled at least a dozen cans of exotic beer out of his Gorilla pack. Both of us were carrying around 20 lbs, including consumables. I opted for one of my smallest hammocks, the Grand Trunk Nano 7 (5 oz/142 g), but looking back, I could have brought any hammock that was 10 ft (3 m) or shorter. I think a 9.5 ft (290 cm) hammock is ideal for the two campgrounds. For suspension, I brought the ENO Atlas Straps (319 g). I went with the Atlas Straps because they (like the Kammok Python Straps) have daisy chain loops sewn every 4 in (10 cm), which provided ideal and easy anchor points anywhere along the length of the strap. 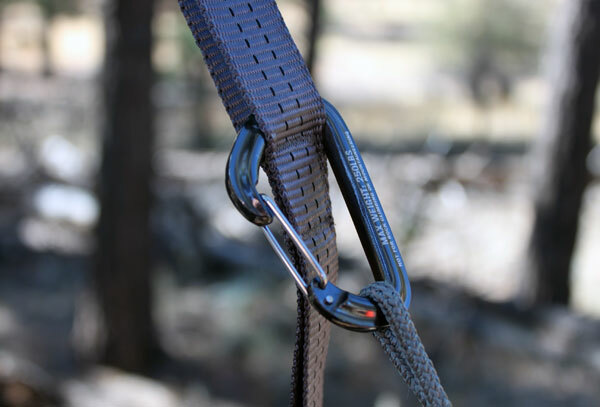 The straps are also very durable and ended up surviving the rock walls in Bright Angel. I used my Kammok mini carabiners (32 g) to connect my hammock to the straps. Temperatures in the canyon were forecast to range from 25°F (-4°C) to 40°F (4°C) at night at the different locations. I used my 20°F top quilt from HammockGear.com and a new Flame Thrower under quilt from Arrowhead Equipment. With my other clothing layers, I ended up being TOO HOT, which, in addition to listening to everyone snoring, contributed to difficult sleeping conditions. On nearly all counts, our trip was a success. I had a great time with my friends and enjoyed my first foray into the canyon. We forged some great friendships with the park staff and rangers, verified that hammock camping is possible within the canyon in limited capacity, and made plans for future development. Our next step is to send the park rangers our recommendations (at their request) for installing permanent hammock stands or multi-use poles at each site at Bright Angel. As temperatures rise in the summer season, hammocks are an ideal sleeping solution in the inner canyon. My only regret is my slow hike out. We had roughly 10 mi (16 km) and 5,000 ft (1,524 m) of elevation before us. While I had a quick start in the morning and was the first to top out, my pace slackened at the end resulting in a 4.5 hour ascent. Mike beat my time by 30 minutes. Awesome post – you’re an incredible asset to the hammock camping community Derek, keep it up! Thanks Seth! Always a pleasure to work with you too. Thanks! Yes, I’m hopeful we can be the catalyst for improvements in the canyon. Who knows what the future may hold! Hello Derek. I just discovered your incredible site! A group of friends and I have been camping at the Bright Angel Campground every November for the last five years. We usually sleep under the stars (no tents/hammocks) but after a nasty storm in 2011 we all decided to bring shelters. Last year was the first year we have not secured the rock house. I had went out on a limb and brounght my ENO Double Nest. We had the other group site and I was thankful to be able to use the backpack posts. I lucked out despite being new to hammock camping. Thanks for your efforts to work with the park staff! I think this would be great if they added stands down there. Doing the Hermit-Boucher Trail Loop in two weeks. Not sure if can source a Handy Hammock Stand in time for this one though. Great write-up! Yes, you are lucky! Those backpack posts are perfect for a hammock, maybe two in a pinch. It will be great if we can get some support to get hammock posts in all the sites at Bright Angel. Nice guys for the post and info. I’m going in Feb for 5 nights to the canyon and will be hanging wherever possible and bivy style with hiking poles where not. I hope to keep promoting hammocks with any rangers I see as well. Hello Derek. I just discovered your incredible web site also! I’m planning a backpacking trip to Grand Canyon for 2016 in early March. I would love to hammock there too. Would you mind if I pick your brain while getting these plans nailed down? For sure! Send me an email and we can connect. Rusty and Derek… I did 5 nights by hammock at the end of Feb this year, it was an awesome trip. One night at bright angel I had hammock on the ground with my poles to hold open a bivy style. Unfortunately that night poured and water pooled underneath me. Still stayed dry but wish I was hanging. I was able to hang using a piknic table in one of the multi level sites up at cottonwood and then came back to bright angle. Got to hang in one site from the rocks (was a bit of a outcrop on each side). Then 2 nights at indian gardens was perfect for hammocks as the new pack hangs make it easy to sling from the pack hang to the covered table at each site. Not all work, but look around the sites, if you have some selection you should easily find one that works well. I do not understand the thinking behind taking a hammock stand. It alone weighs more than a fully-equiped TarpTent (made in the USA!). Also, hammock use, as noted, is highly impractical (and not legal) in The Canyon because trees are a rare resource. You might wish to consider a TarpTent – which uses trekking poles (reducing weight). Hammock camping in desert areas? Not very practical. I can see how they might be useful when camping below tree line, yet above the scrub, on a precipitous side-hill (yet, who wants to camp here?). Tree line? Hummm, another of the many wonderful environments where hammock camping makes little practical sense. Hiking the JMT, nahhh. Hiking the PCT, Nahhh. Hiking the GEM – nahhh. Rob, thanks for your insightful comments. You are correct, and I would echo your statements, that hammocks are not ideal everywhere. I suppose that goes without saying. I will add, however, that for some folks, the comfort and good rest achieved in a hammock is worth the 1.5 kg additional weight of a backpacking stand (which, I must clarify, is only really practical in places devoid of trees or where that resource is unavailable for whatever reason). If you are a weight weenie, there are lots of ways to hammock camp and still be at the SUL weight. 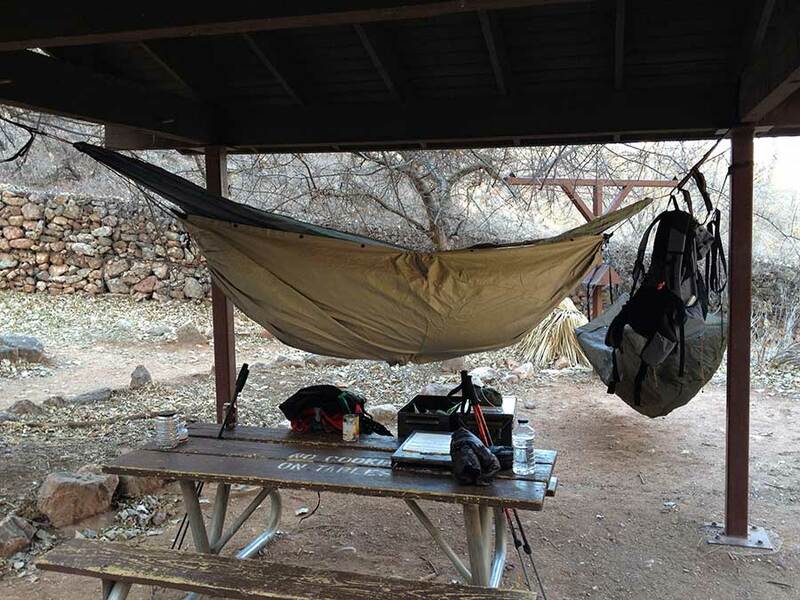 I did want to clarify your note about the Grand Canyon, in case you missed it in the article: hammock camping is legal in the canyon, so long as you do it under the direction of the rangers, as we did as I highlighted in this article. I agree Derek, the thinking behind a hammock stand would be to simply get the best night’s sleep possible while backpacking. I know that is what a hammock gives me and I always get an awesome rest in my hammock. Being from Calgary,CAN, near the rockies, most of the time, its the simplest shelter that goes up anywhere, as we have no shortage of trees, but some areas, its not ideal. Personally, I’d trade 2 nights bivy style for one night hanging in the woods if it comes down to it, as that is still the best sleep I can get. Not yet 🙁 I’m trying to get a scout to use it as an opportunity for an eagle project. That would seem like an easy-do, Scouts are always looking for projects. When I was a District Rep we would frequently have more requests than projects. Wondering if any thing was put up yet? Making plans for ’18 & taking 3 kids. Thanks! Not yet. Not that I’m aware of. Indian Garden campground can accommodate hammocks. Check with the rangers.